Location-based apps have got a considerable share in the contemporary mobile app market. Location-based mobile products, especially geolocation apps, are being used extensively by myriad people on a regular basis these days. Location services play a key role in navigation apps, regardless of whether it is forecast services, games, and many more modern utilities such as social media apps. Geolocation helps expand the capabilities of mobile apps, enabling them to improve user interaction with clients. This feature serves as the source of new and novel ideas for marketers and developers alike. Mobile apps that are being used all over the world such as Uber are relying on location-based apps development. With so much at stake, building location based apps becomes imperative for business organizations across the globe. A staggering 95% of the 18 to 30-year old Population of the World uses location-based service apps! Considering the global Smartphone penetration rate and the dependence of mobility solutions on geolocation services, it is not exaggeration to say that developing apps that use geolocation may expose your business to unimaginable number of potential users across the globe. Why, it will help reach over 200 million people in the US alone. The geolocation trend has ensconced firmly and widely in today’s mobile application market. Geolocation in mobile apps has paved the way for new start-up ideas while making itself indispensable to established businesses as well. Now, the time has come where businesses of any size and type may not fare well basically, without using this innovative and useful technology. Certain modern mobile apps that are entirely based on this technology have created a niche for location-based services among mobility solutions. Others make use of this as an added feature for effectively extending their services and thus making them more advanced and attractive. Global market of location-based apps development has been growing steadily, thanks to the modern trend of using geolocation for almost any service on the mobile technology ecosystem. Location-based apps development, by its exclusive design catering to the needs of modern users, makes efficient use of today’s Internet-enabled and GPS-activated devices with timely, appropriate, and location-specific content. 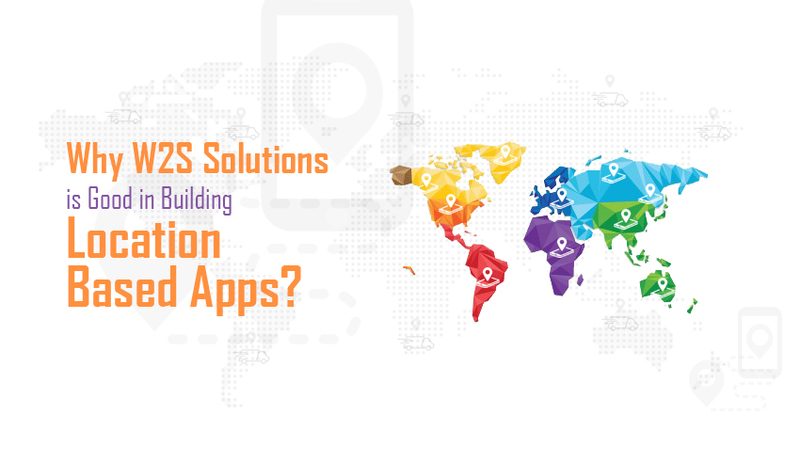 W2S Solutions, with its professional team of skilled developers and years of industry experience, provides the most reliable and robust location-based apps development solutions. This facilitates mobile users with immediate access to products and services, information, product alternatives, price comparisons, reviews, and purchase options. With higher mobile network speed and wider coverage, number of location-based service users is on the rise globally. Smart Contextual Beacons: A layer of contextual awareness is added to the location-based app, improving its analytic understanding. This enables giving incredibly intelligent notifications to your users that they are interested in. Digital Location Indexing: Physical locations related to your business will be digitally indexed. With your products, services, and other points of interest being effectively indexed, your app gets more interactive when it comes to searching for specific products and services, mapping and navigation of indoor locations and beacons and availability features. Geofencing Around your Competition: Geofencing is used around your business while building location based apps, facilitating you to understand about your users being loyal to your brand and to your competitors. This data helps in diverting users toward your business. Background Location Detection: A lot of insights and manifold audience coverage can be obtained by the location detector. This helps enhance your mobile strategy, while enabling notifying your customers of the recent offers. Location Confirmation at Checkout: The feature of confirming customer location helps retail businesses to track the whereabouts of customers. Real-time Location Tracking: The real-time tracking feature helps sharing the location with others, helping in several activities such as finding vehicles, booking vehicles, tracking shipments, searching places and much more. On-demand services: Geolocation technology has enabled managing delivery-based businesses, regardless of whether it is food industry, fleet management, parcel delivery tracking, or any other location-based processes. Navigation and Maps: The primary goals in building location based apps are terrain navigation and mapping services. Health and Fitness Apps: GPS data helps track sports patterns and activities. Geosocial apps: Users can share content based on locations. Hobbies and Lifestyle: Users can be connected according to their specific lifestyle and interests, using lifestyle apps. Social networking services: Connecting people in line with their personal or business interests proves significant in the modern world. E-Commerce Apps: Online business transactions have become the order of the day; geographical location brings in improved user experience in E-Commerce apps. Event Apps: Hosting events becomes efficient by putting together users and hosts when location-based apps are used. How Does W2S Achieve Being Ranked as the Top in Building Location-Based Apps? We have specialized in providing location-based apps development for building feature-rich, attractive and useful mobile apps. Our services ensure that organizations achieve their business objectives, increase their sales, build their brand and improve their customer service. Previous Previous post: Industry 4.0: The Greatest Phenomenon of the Millennial Generation and what it could mean to them? Next Next post: How To Build A Complex Map Based App With LeafletJS?